MRI stands for magnetic resonance imaging. In actuality, the proper name for this study is a nuclear magnetic resonance image (NMRI), but when the technique was being developed for use in health care the connotation of the word "nuclear" was felt to be too negative and was left out of the accepted name. MRI is based on the physical and chemical principles of nuclear magnetic resonance (NMR), a technique used to gain information about the nature of molecules. The largest part of the MRI is the primary magnet. Developing a magnetic field of adequate strength to create MRI images was an early hurdle to overcome in the development of this technology. The gradient magnets are the "fine-tuning" part of the MRI machine. They allow the MRI to focus on a specific part of the body. The gradient magnets are also responsible for the "clanging noise" in an MRI. Next to the part of your body being imaged is the coil. There are coils made for shoulders, knees, and other body parts. The coil will emit a radiofrequency that makes an MRI possible. 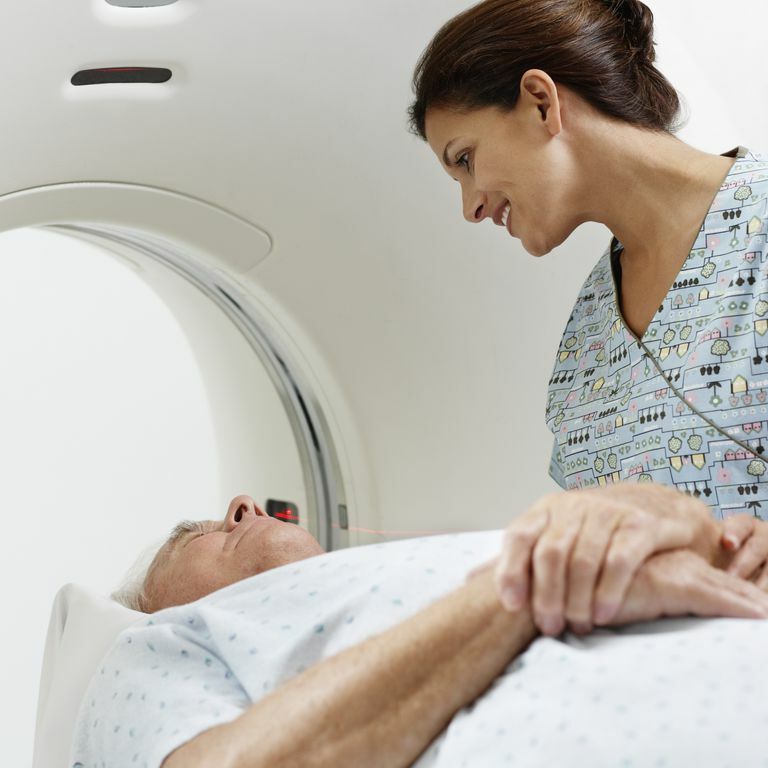 A permanent magnet (like the kind you use on your refrigerator door) powerful enough to use in an MRI would be too costly to produce and too cumbersome to store. The other way to make a magnet is to coil electrical wire and run a current through the wire. This creates a magnetic field within the center of the coil. In order to create a strong enough magnetic field to perform MRI, the coils of wire must have no resistance; therefore they are bathed in liquid helium at a temperature 450 degrees Fahrenheit below zero! This allows the coils to develop magnetic fields of 1.5 to 3 Tesla (the strength of most medical MRIs), more than 20,000 times stronger than the earth's magnetic field. There are three smaller magnets within an MRI machine called gradient magnets. These magnets are much smaller that the primary magnet (about 1/1000 as strong), but they allow the magnetic field to be altered very precisely. It is these gradient magnets that allow image "slices" of the body to be created. By altering the gradient magnets, the magnetic field can be specifically focused on a selected part of the body. MRI uses properties of hydrogen atoms to distinguish between different tissues within the human body. The human body is composed primarily of hydrogen atoms (63%), other common elements are oxygen (26%), carbon (9%), nitrogen (1%), and relatively small amounts of phosphorus, calcium, and sodium. MRI uses a property of atoms called "spin" to distinguish differences between tissues such as muscle, fat, and tendon. With a patient in an MRI machine and the magnet turned on, the nuclei of the hydrogen atoms tend to spin in one of two directions. These hydrogen atom nuclei can transition their spin orientation, or precess, to the opposite orientation. In order to spin the other direction, the coil emits a radio-frequency (RF) that causes this transition (the frequency of energy required to make this transition is specific, and called the Larmour Frequency). The signal that is used in creating MRI images is derived from the energy released by molecules transitioning or precessing, from their high-energy to their low-energy state. This exchange of energy between spin states is called resonance, and thus the name magnetic resonance imaging. The coil also functions to detect the energy given off by magnetic induction from the precessing of the atoms. A computer interprets the data and creates images that display the different resonance characteristics of different tissue types. We see this as an image of shades of gray--some body tissues show up darker or lighter, all depending on the above processes. Patients with metal implants in the body need to alert the MRI staff prior to undergoing an MRI test. Some metal implants are compatible with MRI, including most orthopedic implants. However, some implants prevent patients from ever having an MRI, such as aneurysm clips in the brain and metallic eye implants. Patients with pacemakers or internal defibrillators need to alert the MRI staff, as these devices prevent the use of an MRI test. Any metal clothing or jewelry should be removed prior to undergoing an MRI study. Metal objects in the vicinity of an MRI can be dangerous. In 2001, a six-year-old boy was killed when an oxygen tank struck the child. When the MRI magnet was turned on, the oxygen tank was sucked into the MRI, and the child was struck by this heavy object. Because of this potential problem, the MRI staff is extremely careful in ensuring the safety of patients. Patients often complain of a 'clanging' noise caused by MRI machines. This noise is coming from the gradient magnets that were described previously. These gradient magnets are actually quite small compared to the primary MRI magnet, but they are important in allowing subtle alterations in the magnetic field to best 'see' the appropriate part of the body. Some patients are claustrophobic and do not like getting in an MRI machine. Fortunately, there are several options available. New MRIs do not require you to lie within a tube. Rather, patients having a MRI of the knee, ankle, foot, elbow, or wrist, can simply place that body part within the MRI machine. This type of machine does not work for MRI of the shoulders, spine, hips, or pelvis. Open MRIs had significant quality problems, but the image technology has improved quite a bit in the past several years. While closed MRIs are still preferred by many doctors, open MRI may be a suitable alternative. Some patients have trouble sitting still for the 45 minutes it takes to complete a MRI, especially with the clanging noise. Therefore, it may be appropriate to take a medication to relax prior to having a MRI study. Discuss this with your doctor prior to scheduling the MRI study.